It's no secret that my boys love their ABCs! 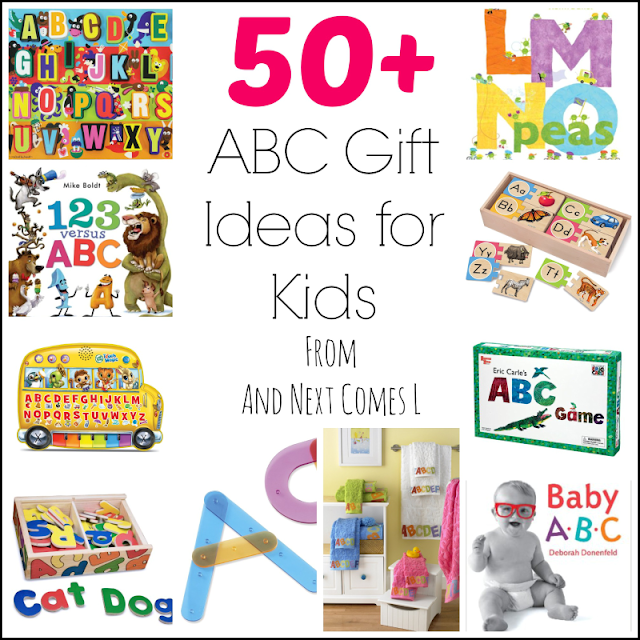 So I am hooking you up with some great gift ideas for those alphabet loving kids in your life. I have compiled over 50 ABC gift ideas for kids, including alphabet puzzles, toys, games, books, DVDs, and things for around the house. 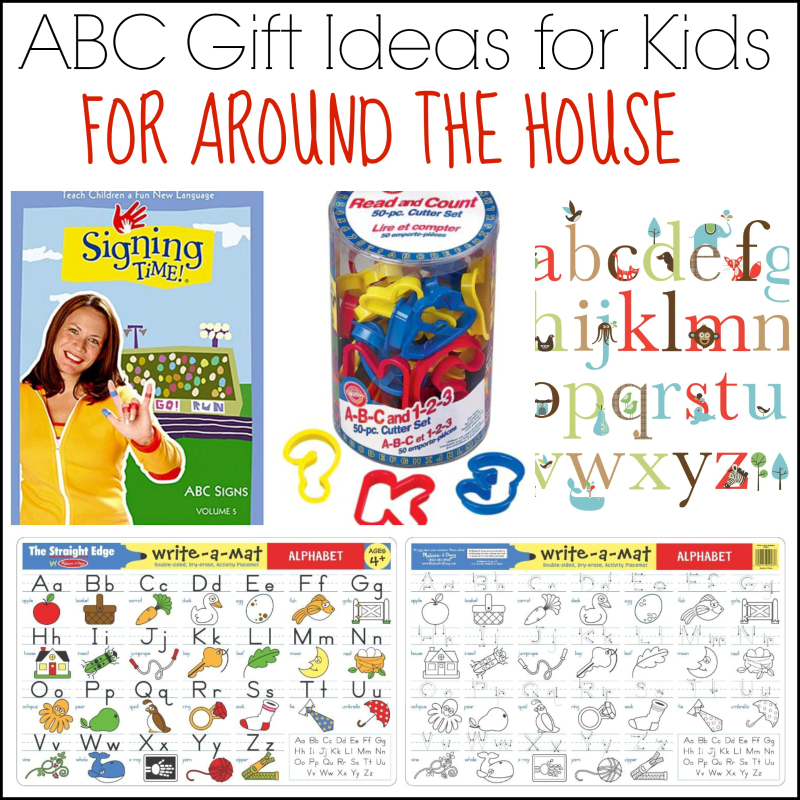 These gift ideas are great for toddlers and preschoolers learning their ABCs or for those kids with hyperlexia who live and breathe everything letter related. 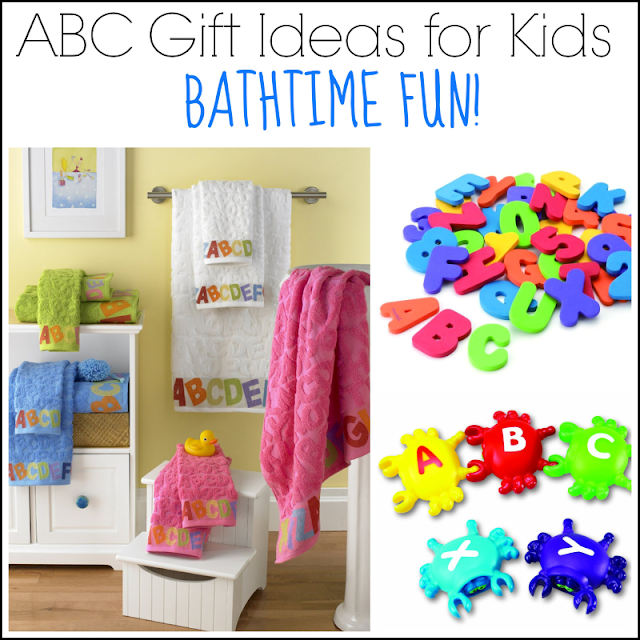 Make bathtime fun with some cool alphabet toys like these linking alphabet crabs or these foam bath letters. Then be sure to dry off with some cool textured alphabet towels in green, pink, blue, or white. We have the green set in the boys' bathroom and I love them! We absolutely love Signing Time in our house and the boys especially love to relax in the living room and watch the ABC Signs DVD. When in the kitchen, make some alphabet cookies or practice making letters in play dough using some ABC cookie cutters. My boys especially love to use these cookie cutters in play dough! We also have this dry erase alphabet placemat on our kitchen table. We don't necessarily use the dry erase crayons with it, but the boys enjoy pointing out letters while waiting for their supper to cool. Finally, decorate a child's bedroom or play room with some alphabet wall decals. We have some in our basement and J used to spend hours riding on daddy's shoulders pointing to the letters while singing the ABC song! K, on the other hand, just climbs stuff and points to the letters all by himself. If you're looking for electronic toys to help your kids learn the ABCs, I recommend the Thomas ABC Train, even if you're not a train fan. Neither of my boys like trains that much, but they love this toy. We keep it in the car all the time and the boys like to play on it when we have to go on long car rides. We also keep this alphabet learning bus in the car too. However, we have the French version so J and K have been learning their French letters because of it. My boys also enjoy the tote and go laptop because it has lots of learning games on it. We haven't had to change the batteries once in any of these toys even after owning the train and the laptop for two years! If you're looking for battery-free ABC toys, I highly recommend owning a set of wooden ABC blocks. They're great for stacking, but J first learned how to identify his name because of them. We used to spell his name with them all of the time when he was a toddler. These ABC house blocks look really cute too! And this wooden alphabet abacus would have definitely been a hit with my boys. In terms of sensory play, I would really love a set of these translucent letter builders to use on our light table or overhead projector. They would be fantastic on there! I think my boys would also enjoy these letter sand molds for the sandbox in our backyard. I'm sure that there are lots of alphabet board games out there, but we own Eric Carle's ABC Game and the Super Why ABC Letter Game and love them both. We love Melissa & Doug puzzles in our house and the boys particularly enjoy the ABC chunky puzzle and alphabet train floor puzzle that we own. I know they would love these other ABC wooden puzzles from Melissa & Doug, including the self-correcting letter puzzles, sound puzzle, upper and lower case puzzle, and see inside peg puzzle. We also love Dr. Seuss. Like a lot. Seriously. We have the Head to Tail ABC floor puzzle and it's really cute, but I really love the look of this wooden Dr. Seuss alphabet puzzle. I'm pretty sure my boys would adore it! 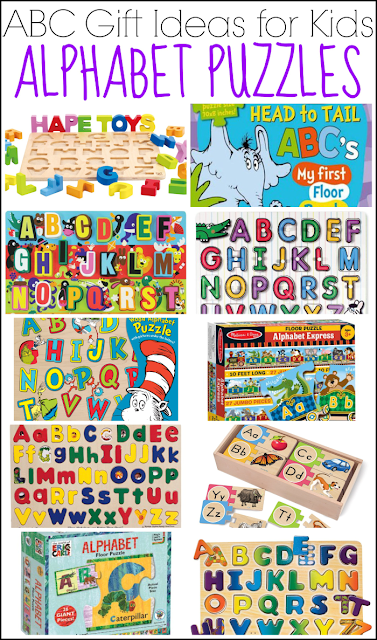 Some other cool puzzles to check out are this colorful wooden alphabet puzzle from Hape and this alphabet floor puzzle that's inspired by the works of Eric Carle. 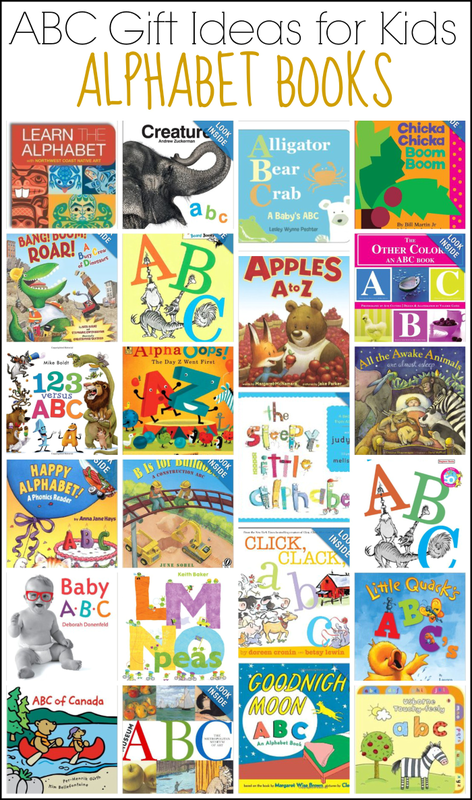 There are so many fantastic alphabet books out there so it's hard to pick the best of the best, but our all time favorites are Creature ABC, Dr. Seuss's ABC (I can recite that book off by heart! ), 123 Versus ABC, Usborne Touchy Feely ABC Book, and Happy Alphabet! A Phonics Reader. We also have an amazing basketball ABC book and another really cool interactive ABC book called ABC Do, but I cannot find them on Amazon. They might be exclusive Canadian titles or something, but they are great books. What's your favorite ABC books? We'd love to check them out. Ooh, great ideas! The Melissa and Doug wooden alphabet magnets will be under our tree this year. I love those cookie cutters too! Our wooden magnets get used every single day! And those cookie cutters are great. The company is awesome too. Our set was missing the T cookie cutter so I wrote to the company and within two weeks, we received a replacement one from them. I love companies like that! Love these ideas -thanks! I especially like those towels! Those towels are really cool! I couldn't resist buying a set when I saw them! I enjoy the signing time videos and the bathtub foam letters. 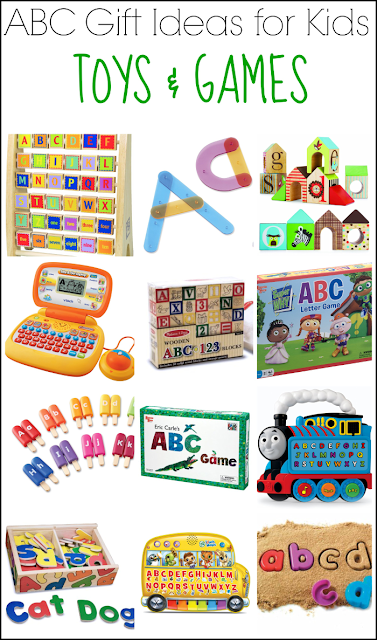 Great way to get more alphabet play in! It sure is! My boys love both!